Passionate, self-starting, deadline-driven writing professional. Reputation for creative, original, branded content across multiple channels. Organized, flexible, problem-solver valued for can-do attitude. Experienced story-teller, theatrical director, script analyst, and orals coach. Visit the Driving Aids Development Corporation Newsletter. Visit the Vancouver Career College Newsletter. View ﻿Mini Hits the Racetrack﻿ video. Read A Mini Roadtrip at Sports 'N Spokes Magazine. View Hello from DADC ​video. View CGI ERP Fit ​video. View CGI Built for Government ​video. Visit the Reeves College Newsletter. Secure the steady stream of multi-channel, perception-building content you need to engage your clients. 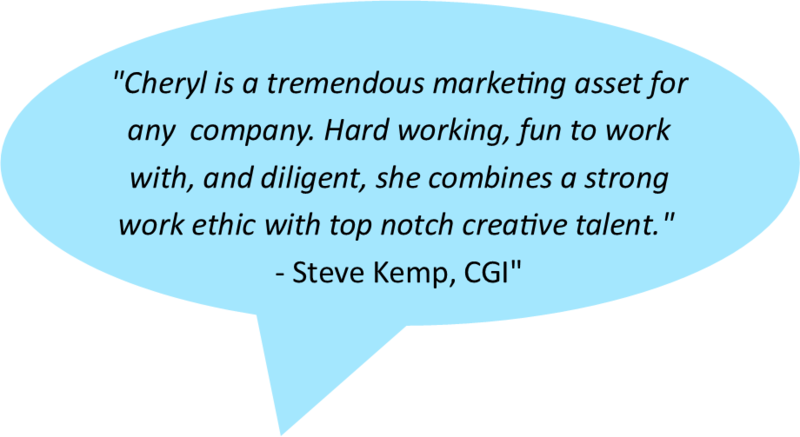 Engage 20 years of proven content marketing experience with Cheryl today!